Putting together an amateur dramatics society is an exciting venture but without a locale in which to perform, it will be impossible to get that first production off the ground. Fortunately, amateur dramatics troupes have a plethora of opportunities when it comes to finding venues, including those listed below. Note their pros and cons before proceeding, however; depending upon your performance requirements, some "theatres" may be more or less effective than others. Pros: Usually, churches will be willing to help amateur dramatics groups with advertising, at least on a minimal level. They may also be well stocked with tables and chairs (or pews) that groups can use. Finally, most churches offer low rates to amateur dramatics folks who wish to stage performances in their spaces. Cons: It's typical for churches to be concerned about the content of a production before giving the "go ahead" to the dramatics society leadership. Even an Ibsen classic could be frowned upon, so the type of theatre in which your troupe engages may preclude the usage of a church. Many community fitness centres have gymnasiums or large recreational facilities that can be modified and essentially turned into "theatres". Cons: Gymnasium acoustics can be dreadful, so keep this in mind before deciding upon this kind of atmosphere for your performance. Some restaurants, hotels and inns have larger meeting spaces, which are normally rented out to parties, but could be turned into theatre venues for a night or two. Their sizes vary, but most are attractively decorated and the hosting locale may be willing to provide cushioned seating. Pros: Heading to a restaurant or inn is a pleasure for most audience members, especially if the amateur dramatics society can swing a "dinner and theatre" special rate for ticket holders. Cons: The price to perform at a well-known restaurant or inn can seriously cripple a fledgling organisation. Unless you have an "in" at the "inn", you may be wise to go elsewhere, at least at first. Schools are set up for theatrical performances, and most have some kind of a stage environment (even if it's just a makeshift one.) This makes it simple for an amateur dramatics group to set up shop for a few evenings or weekend afternoons. 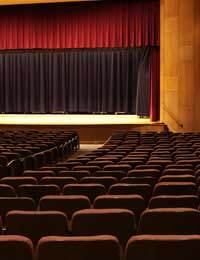 Pros: Your amateur dramatics group may get an extra publicity boost when performing in this type of venue, because parents, teachers, administrators and students will most likely be informed of your performance. Cons: Depending upon the school, you may have to complete a good deal of paperwork before being allowed to use facilities. You will also be competing with numerous school-driven events for space and time. For millennia, dramatics groups have made natural settings their homes. From amphitheatres to Parks, troupes have entertained and educated among flora and fauna… which means that your amateur dramatics society can, too! Pros: There's something intrinsically romantic about a performance out-of-doors. People bring picnic wares and blankets and feel close to the earth while watching live performances. Cons: Weather and acoustics are two problems when contemplating outdoor theatre, though neither is insurmountable given the right precautions. Another concern can be with charging for admittance, since it can be difficult to "rope off" an area in a park. Always remember that the key to venue finding for your amateur dramatics society is to recognise that there probably isn't one perfect venue. Be creative, be open-minded and try several options on "for size", so to speak. After some trial and error, you'll have a good indication of where your new troupe belongs.